AqualogicTM Compact Flow-Through Treatment Systems are modular, automatic treatment systems designed to treat industrial wastewater. at flows of 5-20 gallons per minute. The equipment will treat mixed rinsewaters for precipitation of heavy metals, solid dewatering, and removal of oils and greases, producing an effluent suitable for discharge to local sewers, according to permit regulations. The treatment module is a three compartment tank with full width overflow/underflow baffles to prevent short circuiting of effluent. Metering pumps are premounted on a shelf on the tanks and plumbed to the injection point on the tank. Mixers for each compartment are premounted. All wiring is connected to the control panel mounted on the module. The control panel houses pH instrumentation and a PLC programmed to control all process steps. An operator interface is mounted on the door for process inputs. The unique Aqualogic settling tank results in lower suspended solids in the final effluent than the typical inclined plate or lamella type clarifier. The inverted T shape sludge pick-up also thickens the sludge blanket as it slowly traverses the settling tank. The sludge hold tank is covered with a grate to serve as an access platform for the settling tank and the three compartment reaction tank. The three compartment reaction vessel allows for initial pH adjustment to enable reagents for chelate breaking or oil removal to perform properly. The second compartment adjusts the effluent pH to the optimum value for metal precipitation. The third compartment is equipped with a low shear mixer to optimize the formation of floc particles for settling. Many metal finishers have process solutions which contain substances that require pretreatment before the system can be effective. The most common substances are hexavalent chromium and free cyanide. Modules are available to be added to the main system to reduce chrome and oxidize cyanide. Chrome reduction reactors are supplied with covers and a vent which may be attached to the exhaust system to vent any fumes. The cyanide oxidation reactors are two stage with extended reaction time to assure complete destruction. Controls for these modules are incorporated into the main control panel to integrate the management of the system. Aqualogic Inc. has been engineering, building, and installing industrial wastewater treatment systems since 1966. Many of our clients have discharge limits significantly more stringent than Federal limits and are meeting these limits directly from the clarifier. We believe that every clients effluent is unique and requires special attention. This is why Aqualogic Performs treatability studies on the effluent for each of our clients to optimize treatment procedures. 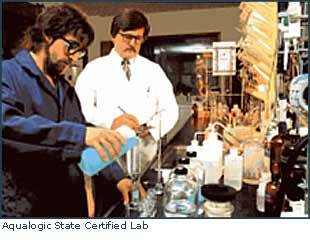 Aqualogic also maintains a State certified laboratory to analyze the results of our treatability studies and to provide services to our clients on an ongoing basis.